In a mixing bowl, add all the ingredients for the batter and mix well. Heat oil in a pan on medium heat. To test if the oil is ready, add a drop of the batter to the oil and it should rise to the surface immediately without getting burnt. Dust the sausage halves with a bit of flour ( so that the batter can stick to it ) and dip it in the batter to coat it well. Shake the access batter off and drop the sausages gently into the hot oil. Fry for 2-3 mins and serve hot with a sauce of your choice. To make it easier for the kids to eat it , poke a tooth pick or satay stick to the end of the corn dog. They will love it , just like my kids did ! 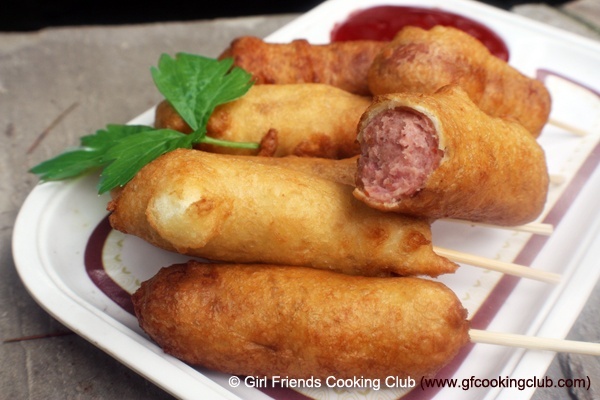 This entry was posted in Chicken, Pork, Snacks & Appetizers and tagged Corn Dogs by Kamakshi. Bookmark the permalink.